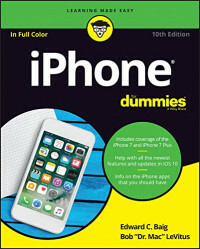 Apple keeps packing more punch into the iPhone, and iPhone For Dummies has been the go-to guide for aficionados from the start! Just like those that came before it, this new edition leaves no stone unturned, giving you thorough and easy-to-follow guidance on everything you need to unlock all your iPhone has to offer. From using FaceTime to connect with friends to setting up your iPhone to stay organized and on time, this is the essential iPhone companion guide no user should be without. Think about the iPhone. It's a device capable of communicating with anyone across the globe, connecting to the world's knowledge, fetching music and video, and assisting with day-to-day chores. In short, it's science fiction come to life. iPhone For Dummies provides the insight and know-how you need to squeeze all these wonders out of your iPhone—while having a whole lot of fun in the process. Don't waste a minute! Swipe, tap, and type your way to all the fun and functionality your iPhone has to offer!